Travel back in time with your family and experience movie going as it was in the golden age of silent movies in Phoenix's only remaining movie palace, the beautiful Orpheum Theatre. Each Silent Sundays program features a family enjoyable silent film classic with live accompaniment provided by a world famous organist on the Orpheum's Mighty Wurlitzer Theatre Organ. Children Under 12 - FREE! The Phoenix Orpheum Theatre is the last remaining movie palace in Phoenix. It opened in 1929 as venue for vaudeville acts as part of the nationwide Orpheum Circuit. Its beautiful Spanish Revival style architecture and its atmospheric ceiling, complete with sunrises, sunsets, stars and moving clouds give patrons the impression that they are enjoying the show al fresco. The theatre was purchased by the City of Phoenix in 1984 and restored to its original elegance over a period of twelve years. The theatre is the only theatre designated historic in the valley, and was listed on the National Register of Historic Places in 1985. Like most theatres of the day, the Orpheum originally had a pipe organ to provide the musical accompaniment to silent films but it had been removed and no funds had been allocated for a replacement as part of the theatre restoration. The Valley of the Sun Chapter of the American Theatre Organ society raised the funds necessary to purchase and install the pipe organ now in the theatre. The organ has over 2000 pipes as well as various percussion instruments and sound effects. It has an appraised value of over $250,000. The Valley of the Sun Chapter owns and maintains the organ at its expense and makes it available to interested parties under an agreement with the City of Phoenix. Receipts from Silent Sundays are used in large part for the continued maintenance of this historical musical resource. He plays annually for several film festivals including the International Film Festival hosted by the American Film Institute, and has been a featured performer at national conventions of the American Guild of Organists and the American Theatre Organ Society. He has toured extensively as a solo artist, featured soloist with orchestras, and film accompanist abroad and throughout the United States. Donald Hall is Humanities Faculty at Gateway Community College. In addition to teaching, Don is actively engaged in the arts community and has developed innovative ways of exposing students to a variety of community based educational experiences where they have opportunities to appreciate art, music, dance, theatre and film. Subscribe to our Silent Sundays mailing list to receive show reminders, special offers, and the latest information on Silent Sundays Events. FilmBar is a 21+ beer/wine bar featuring food, craft beers and ciders, wines and a separate, sound-proofed room dedicated to screening new, classic, cult and local independent films in a microcinema setting (76 seats). 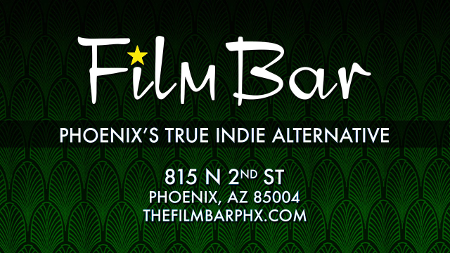 FilmBar is absolutely a unique place in Phoenix and seeks to build equally awesome bar and film crowds! GateWay Community College is one of the 10 Maricopa Community Colleges, and is fully accredited by the Higher Learning Commission. We offer workforce training and over 100 certificate and degree programs in the areas of Business, Information Technology, Healthcare, Industrial Technology, Nursing, Automotive Technology, Environment, General Education and University Transfer. GateWay works with you to design an education that fits your life, your budget and your goals for the future. Our small campus environment provides the flexibility, personal attention and support services that result in an enhanced career and a better life. GateWay's career courses and programs address the needs of over 16,000 students annually, as well as the demands of surrounding business communities. With a light rail stop on campus, we’re accessible to students across the valley. Learn more, live better.